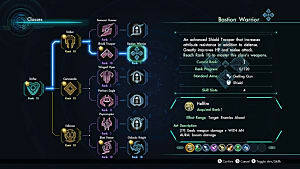 Xenoblade Chronicles X has many classes to choose from. 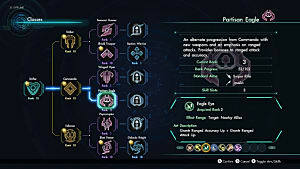 After you get the beginning Drifter class to Rank 10, you unlock the 3 base classes. Each of these base classes branch into 2 different classes for a total of 6 final classes. 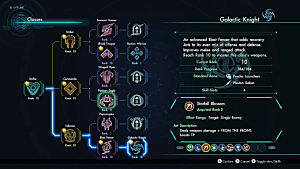 I'm going to explain the general play styles and give info on the 3 base classes in this guide. I'll have links to the specific class guides they all branch into in their respective sections. For general battle help, see my Combat Tips. 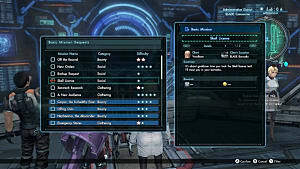 Striker Class Info - Arts, weapons, and skills for this class. Commando Info - Arts, weapons, and skills for this class. 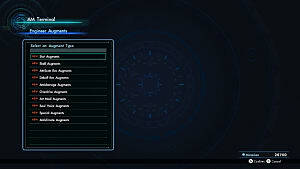 Enforcer Info - Arts, weapons, and skills for this class. This is the most beginner friendly class. It gives a boost to melee damage, HP, and gives a mix of offensive and defensive arts. 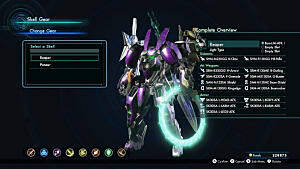 It branches into the Samurai Gunner/Duelist class for a bigger focus on offense, or the Shield Trooper/Bastion Warrior class for a bigger focus on defense and HP. Rising Blade (Longsword) - Deals weapon damage to a single enemy. Increased damage when Taunted. Defensive Stance (Longsword) - Reduces damage taken, continually restores HP, and reduces total melee attack for user. Power Dive (Assault Rifle) - Grants Supercharge and total evasion during execution. Tornado Blade (Longsword) - Deals weapon damage to nearby enemies. Increases TP when an Aura is active. Furious Blast (Assault Rifle) - Deals weapon damage to a single enemy and boost damage in melee combos. Magnum Edge (Longsword) - Deals weapon damage and inflicts Physical Res Down to all enemies ahead. Steel Flesh - Increases maximum HP. Unwavering Courage - Increases melee accuracy. Flame Trigger - Increases Blaze damage. Mighty Muscle - Increases Melee attack. Combat Presence - Extends Taunt effects. Dismantler - Grants a chance to deal increased damage to appendages with melee Arts. 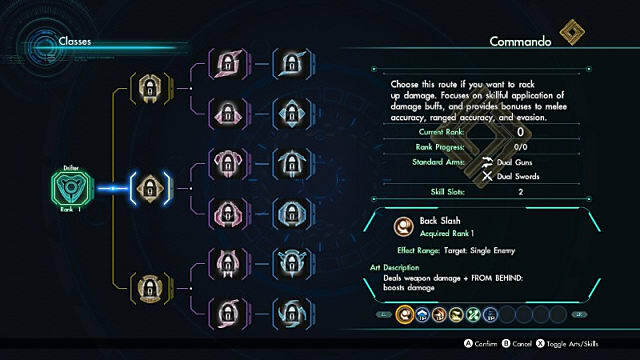 This is a good class for learning positioning in combat. It has many arts that give some kind of bonus if you use them from a certain direction when facing an enemy. It gives bonuses to melee and ranged accuracy. This branches into the Winged Viper/Full Metal Jaguar class for increased evasion, accuracy, and damage. It also branches into the Partisan Eagle/Astral Crusader class for a focus on ranged attack and accuracy. Back Slash (Dual Swords) - Deals weapon damage to a single enemy. Increased damage when used from behind the enemy. Early Bird (Dual Guns) - Raises Critical Power tier, increases critical chance, and increases evasion for the user. Stream Edge (Dual Swords) - Deals weapon damage and increases damage in ranged combos. Upper Hand (Dual Swords) - Grants Critical Power to user. Shadow Runner (Dual Swords) - Increases Potential to user. 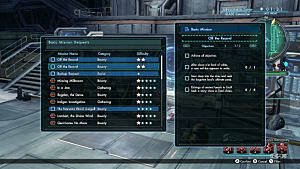 Also increases damage and disables enemy detection when used from behind enemy. Agile Gunslinger - Increases Evasion when wielding a ranged weapon. Steady Hand - Increases ranged accuracy. Boosted Bullets - Increases ranged attack. Background Noise - Increases damage when using melee Arts from behind. Combo Gunner - Increases damage when triggering ranged combos. Third Eye - Increases TP when using an Art. Doubled when an Aura is active. Master Edge - Increases critical chance when using a melee weapon. The Enforcer class focuses on debuffing the enemy and supporting your team. 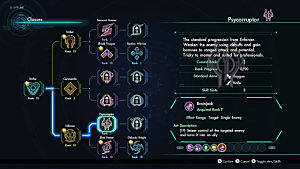 It branches into the Psycorruptor/Mastermind class for complete control and debuff specialty, or Blast Fencer/Galactic Knight for focus on Beam damage. Beam Barrage (Raygun) - Deals weapon damage to all enemies ahead. Increased damage when an Aura is active. Repair (Knife) - Removes Debuffs and restores HP to one ally. Myopic Screen (Raygun) - Deals weapon damage and inflicts Blackout to all enemies ahead. Full Specs (Knife) - Increases Potential, ranged attack, and Ether resistance. Inner Search - Increases Potential. Beam Boost - Increases Beam damage. Beam Guard - Increases Beam resistance when wielding a ranged weapon. Buff Heal - Recovers HP when receiving a Buff. Healing Touch - Increases the HP recovery of your part members when you revive. High Tension - Increases maximum TP. 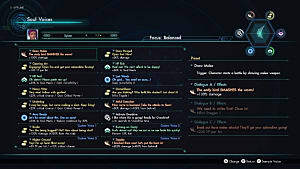 That's it for my Base Class guide for Xenoblade Chronicles X. Let me know if you have any questions!